She is known as cupid for her track record of successfully matching seven married couples. "I just love love." “I am a passionate volunteer for the Leukemia Lymphoma Society. In 2014, I competed for the organization’s Women of the Year award. Seven men and seven women, nominated by members of the community, competed by secret fundraising, meaning no one knew anyone else totals as they raised money. 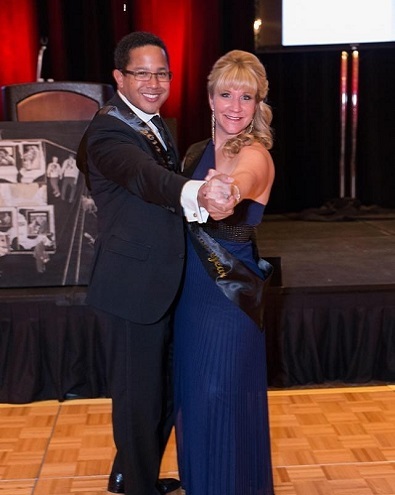 I raised $61,500 in ten weeks and was name Leukemia Lymphoma Society’s 2014 Woman of the Year. That was the highest amount ever raised in Nevada to date. Additionally, I have secured a research grant that I named in honor of my husband who is battling a rare form of leukemia that is not treatable or curable. When diagnosed in 2010 he was given anywhere from two months to two years to live. I am happy to report he is doing well and we will soon be celebrating seven years since his diagnosis.